This is my first sketch from home this year.. After helping out Tanush to sleep, I decided that I need to attend to my growling stomach - I was so hungry, I could help myself to a lunch!! Well, but I just took my cereal bowl and had a nice wholesome cereal.. Manu joined me, pouring himself a small glass of rice wine which we had purchased at the daytime.. He hated it!! He had to throw that one and pour himself another glass of something-else-wine (I'll find out what the name is, from him) to improve his taste... We had a nice time discussing wines based on the ones he had tasted all this while! Good-gyan! And then thank you for your comment on my drawing. I missed your drawings, and I've always thought that you've got an interesting style with awesome coloring techniques. Wonderful sketch! I look forward to seeing your vacation sketches and reading your stories about them! Great sketch. Love the postures; so relaxed and natural looking. Can't wait to see your vacations sketches. Thank you for leaving the lovely comment on my blog! I am so glad it led me here, your work is wonderful. 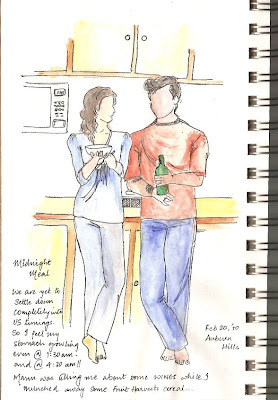 I especially like this sketch of the two of you. So nice to find your blog through EDM. Lovely sketches. I see you are in Michigan also! I'm about an hour or two south of you, near the Ohio border. Welcome, neighbor! Thanks Alex and Nancy for such a warm welcome.. Oh, and, I stay in Auburn Hills..